Are you a Bean Stalker? I have to admit that I kind of am… And by Bean Stalker, I mean someone who “stalks” the adorable cleft palate dog named Lentil Bean via various social media channels and his website. 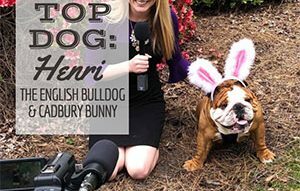 My dream came true when he agreed to let me interview him for CanineJournal.com, but first let me share a little more about him. 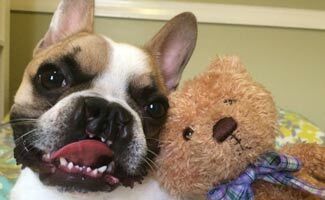 Lentil Bean is a French Bulldog who was born with a cleft palate, lip and nose. He was placed into a rescue facility at two days of age an was tube fed for 4 months before he could have surgery for his cleft repairs. But his “defects” are what make him extra special and are precisely why he is able to make such memorable and adorable facial expressions! 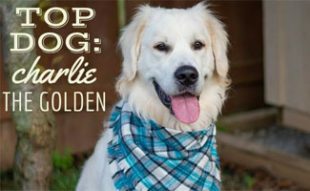 His goal is to raise awareness for animals and people alike who have the same condition and to teach them that their special features are exactly what makes them so awesome. For these noble efforts, Lentil Bean the dog has been named an “Ambassadog” on a “mission to change the world, one smile at a time”. You can become a Bean Stalker too by “liking” Lentil Bean’s Facebook page and checking out his website My Name is Lentil. But first, let’s check out his interview! The fish that we catch when Mama takes me out on a boat! 1.5 years. My Birthday is Feb 2, 2013. Well, that one’s a tough one. It’s hard for me to choose! I love my sister, Tabitha, because it’s fun for me to be her little brother (she tolerates my “goofiness” like biting and trying to belly flop her). There’s also Chris P Bacon. He’s one of my best buds because we are both different and we like to race each other (you’d be surprised at how fast a pig on wheels is)! Last but not least is Stinkie (my dog blanket)! He’s been with me since I was 2 days old and met my Mama Bean! Stinkie is an awesome friend. I take him everywhere and he never complains when I chew on his ears. Definitely my nose. I’m proud to have been born to be different. And one day, I’m going to help to show all children that we should all take pride in being unique! Have your Mama get an iPhone that has the most amount of storage. This allows her to take mass quantities of pictures. And always make sure she has a ball in her hand while doing so! Then smile! But if you don’t want to smile, she will keep going until she snags a shot of what she is looking for. It’s funny to watch! Hands down, it’s Edie! Edie has been fostered under Mama’s rescue, Street Tails Animal Rescue, for years! She has inspired me to make the most out of life, to always take each day as it comes and make the most of it! What many people don’t know is that my page, “My Name is Lentil”, was named after Edie’s Blog: “My Name is Edie“! She and her foster Mama, Annie RULE! 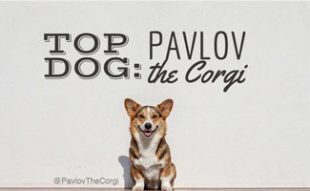 What’s Your Advice For Dogs Looking To Make A Difference? Be true to yourself. Don’t ever set the bar too high. And always remind the world, that you are just ONE dog! 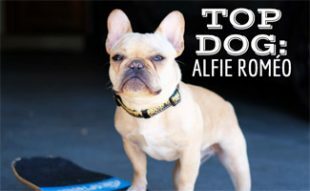 Lentil Bean’s story was featured on an episode of “The Doctors” where they talk with people who have been inspired by Lentil’s cleft palate success story, his eternal optimism and his great smile! Me too – thanks Mary! !